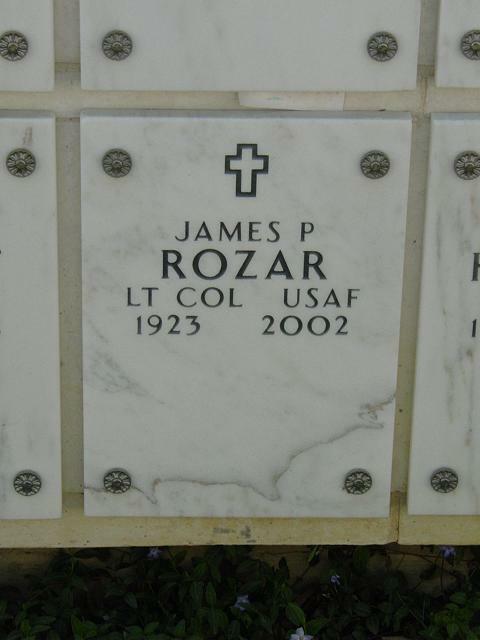 Lieutenant Colonel James P. Rozar, United States Air Force (retired), passed away after a long illness on September 14, 2002 in San Antonio, Texas. He was born in Georgia and served in combat in World War II, where he received a Purple Heart. He was a graduate of the USAF Command and Staff College and received the Legion of Merit before he retired from the USAF in 1970 with 27 years of service. He is survived by his wife, Ginette Rozar; his former wife, Grace Clark and three sons, James T. Rozar, Donald L. Rozar and Christopher L. Rozar. A memorial service will be held at the Fort Myer Chapel on Friday, November 8 at 9 a.m. with interment at Arlington National Cemetery immediately following. In lieu of flowers, expressions of sympathy would be appreciated as a donation to the American Diabetes Foundation.